Starting Point-Teaching Entry Level Geoscience > Teaching with Google Earth > Why Teach With Google Earth? Google Earth is easy to use and presents, in a visual geospatial context, a great deal of information that applies to topics that are addressed in geoscience courses and many other educational settings. By offering the ability to place this information in combination on a three-dimensional model of the Earth, it can facilitate understanding of the Earth system and the many subject areas that comprise it, ranging from natural sciences to social sciences, history, art, engineering and any other topic that has a geographic component. Information that can be displayed on Google Earth includes aerial and satellite imagery, the numerous layers offered by Google's database, and a huge amount of third-party data made available by the Google Earth Community and on other web sites. With Google Earth, students can browse casually on their own or engage in structured inquiry-based explorations individually or in teams. Since Google Earth is available to download for free for all the major operating systems, students can use it in school as well as for homework or fun. They can easily create their own data and save the information in KMZ data files, or as saved images for incorporation into oral presentations or reports. This data can be rendered on maps in combination with any other data made available to the students. 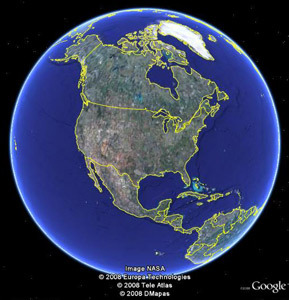 In addition to making it available for students to use for inquiry-driven activities, educators can employ Google Earth directly as a presentation tool for classes or as a means of saving graphics for use in lectures. They can also use it to research topics for use in a variety of educational venues that incorporate electronic presentations, or printed materials that include maps or other graphics. Google for Educators - Earth presents advice on how to use Google Earth in educational settings. In addition to its educational utility, Google Earth is a great research tool. The imagery itself contains a great deal of information about the natural landscape and human infrastructure on the Earth's surface. The constantly growing Street View layer adds dimensionality to this imagery by offering a dense array of 360° panoramic photographs for many cities, towns, and other places around the world. The terrain and 3D Buildings layers also contribute information to the three-dimensional Google Earth experience. The other Google Earth layers offer a wealth of additional geographic information. Many web sites, including the Google Earth Community, offer data designed specifically for use in Google Earth. There are also much data, including imagery and vector data that can be adapted for use in Google Earth even though it was not created for that purpose. Google Earth, due to its ease of use, can become a standard part of everyday discussion in the classroom. For example, if a question about a particular coastal feature or hurricane arises during a course on coastal processes, Google Earth can provide a quick look at the appropriate aerial imagery or plotted hurricane path, especially if the instructor or an enrolled student is familiar with the body of data that is online and available for access. Google Earth is available for free download on Google's Explore, Search, and Discover (more info) page. However, Google also offers various forms of support for educators, students, scientists, and non-profit organizations in the form of software or financial support. Through the KML in Research Competition, scientists, researchers, and students can have their work showcased at Google's booth at the American Geophysical Union (more info) and win GPS and iPod equipment. Geo Challenge Grants provide between $5,000 and $100,000 to "legally qualified, public charitable organizations with a compelling idea about how maps can help them work more effectively". Google Earth Pro grants provide the Pro version of Google Earth for free to organizations thatt have current 501(c)(3) status. No software product is perfectly designed, and with Google Earth, there are design features that some people would like to see improved. For example, with the settings on the timeline, inexperienced users may become confused. Labels on the map can cause confusion when they become closely spaced at some zoom levels. The Google Earth Design blog contains a great deal of useful information about Google Earth, including design limitations, and how to compensate for some of the them. Setting up simple customized Google Maps and posting them on the web requires logging into a free Google account and activating the My Maps tab. A set of tools enables the creation of points, lines and polygons on the map. Descriptive information can be connected with these features for viewing by the user. The map is automatically assigned a url that can be emailed or hyperlinked in a web page in order to share it students or other people. After the map is created, HTML code is also displayed that can be copied into a web page in order to include the map as an embedded object. A web browser is sufficient for viewing maps created in this manner, therefore these maps are a good option in venues where Google Earth might not be available. A KML file that has been stored on a web server can be opened in Google Maps by entering its url in the Google Maps search box. However, while these simple Google Maps are easy to create and share, they are not as feature-rich as Google Earth. While Google Earth is an excellent teaching tool, it does not offer the analytical capabilities of a full-featured geographic information system such as ArcGIS or MapInfo. Alan Glennon wrote two essays, in favor of and opposed to, respectively, the practice of promoting Naive Geography, the field of study that is concerned with using formal models of the common-sense geographic world in the classroom. In Comments Supporting Naive Geography , Glennon argues that "Incorporating common sense conceptions of the geographical world into GIS will make the software more usable, thus adding meaning and value. As multibillion dollar companies like Google and Microsoft formally declare that they are designing spatial software to be understandable and usable for regular users, the impact of the naive geography design philosophy is becoming unmistakable". However, in Comments Against Naive Geography , he points out the dangers that people may develop overly simplistic conceptualizations, that they may be frustrated by finding geographic software less capable than what they expected, and that simplified software may hinder creativity on the part of the user by offering reduced opportunity for control in comparison to GIS software. While these essays do a nice job of presenting opposing views, when considered together they make the case that Google Earth and GIS each have important roles in education and research. In order to mitigate the hazards of using one approach exclusively, and to gain the advantages of each, educators who engage students in using Google Earth should provide students with a sense of how its small set of analytical capabilities differs from those of a full-featured GIS. In courses that include a relatively small amount of map use that does not require a great deal of analysis, Google Earth is generally the best choice. This can be followed by a discussion or demonstration of what GIS can do. However, instructors who include multiple map-oriented exercises in their courses can base at least one of them on GIS, with the inclusion of some analysis that utilizes spatial attributes or other properties of the data, if appropriate for the course material. See Teaching with GIS in the Geosciences in order to compare how using GIS for education differs from using Google Earth.